Several years ago one of of my aunts was moving. While I was helping her move she gave me this old canvas map. I haven’t even unrolled it until recently. It always made me nervous touching it or moving it because pieces would flake off. She told me it was an old map of Perry County, Pennsylvania. I’ve seen plenty of old maps of Perry County before. But they were always old paper maps. This map is made of canvas. As I unrolled it I finally saw how large this map is. It measures approximately 5′ x 5′. 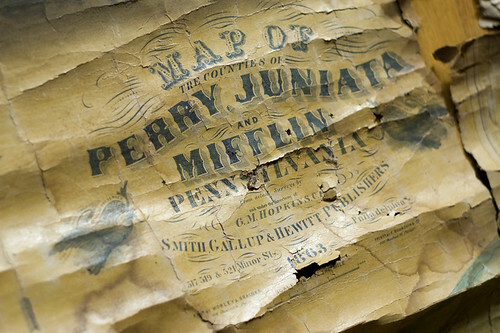 Then after closer inspection I saw the date of the map, 1863. This map dates back to the American Civil War (1861 to 1865)! What an awesome piece of history I have in front of me! I just don’t know what to do with it though. I love history and this map is very cool, but it’s in very bad shape. I’d like to find a way to preserve it. You can view more photos of this map on my Flickr set. Hey Jonathan, I think I found your “what to do”!